Can the company that builds the Hummer go green? You may not think GM has an eco-friendly gene in its body. 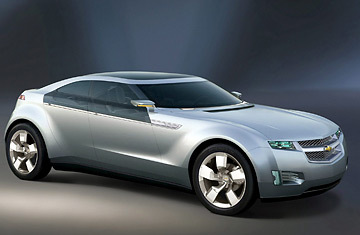 But at the Detroit auto show on Sunday, GM touted a new plug-in electric concept car called the Chevrolet Volt. A lithium ion battery pack powers the car and a three-cylinder engine can recharge the batteries, extending the vehicle's driving range up to 640 miles. The engine also runs on E85 ethanol, getting fuel economy up to 150 miles per gallon  and conceivably eliminating the need for gasoline almost entirely. All in all, it would be a quantum leap over GM's last electric car, the EV1, and GM wasn't shy about saying so. "A GM electric car is an inconvenient truth," quipped vice chairman Bob Lutz. He'd be right too  especially if GM actually produces the Volt or its underlying propulsion system (which isn't ready yet for mass production) instead of merely showcasing the technology. This year, you could practically call the Motor City's flagship exhibition the Detroit eco-tech show. While big SUVs and pickups dominated a few years ago, this time around it is more a showcase for environmentally friendly technologies. Not to be outdone by GM, Ford revealed a funky concept vehicle called Airstream, featuring glow-in-the-dark windows, a lava lamp and an electric powertrain combined with a hydrogen fuel cell. BMW touted its hydrogen technology with a 7-series concept vehicle and promoted its "clean diesel" technology, which it plans to deploy in a model bound for the U.S. in 2008. Just about everyone promised more cars that can run on E85 ethanol/gasoline blend. Mazda even touted the use of recycled materials to make seats and other interior features. "People want to feel good about the choices they make. They want to know they're choosing material that's not going to harm the environment," said Franz von Holzhausen, director of design for Mazda North American Operations. Of course, it wouldn't be an auto show if there weren't some silliness mixed in with the sensible. Chrysler teamed up with celebrity chef Bobby Flay to introduce its all-new 2008 Town Country and Dodge Grand Caravan minivans. Apparently Chrysler wanted to convey the idea that it's cooking up something spicier than dull minivans. And while they still do look pretty plain, Chrysler's new vans have some cool interior features, like seats that swivel 180 degrees and a removable table that fits between the second and third rows. Ford, for its part, announced a deal with Microsoft to equip cars with a voice-activation system for gadgets like a cell phone, iPod or (in Microsoft's dreams) a Zune MP3 player. The system, called Sync, will supposedly convert text messages to audio too. Ford plans to make it available in 12 models over the coming year, though it could be a pricey option. Like most automakers, Ford is courting digitally savvy Gen Y shoppers and hopes the technology will appeal to them in entry-level cars like the 2008 Focus. Ironically, the carmaker at the forefront of hybrid technology, Toyota, was more keen on talking about its new full-size pickup, Tundra. The truck is launching next month and Toyota used its press conference to unveil the massive four-door CrewMax version, touting the vehicle's payload, towing capacity and other manly features (like really big brakes). In the evening, Toyota unveiled a hybrid concept sports car, FT-HS, a sculpted angular beauty with a scalloped hood and retractable roof panel. Considering the Tundra extravaganza, however, it seemed like an afterthought. On Monday Toyota's Lexus division also moved into the fast lane, introducing a high-performance model, the IS-F Sedan, and a redesigned concept sports car, the LF-A. The F Badge will define a new generation of Lexus high-performance models and the specs look impressive: Lexus says the IS-F Sedan, due next year, will sport a 5-Lt. V-8 engine, producing more than 400 horsepower. It's more evidence that even as the Big Three try to follow its lead into green technology, Toyota has no intention of simply building eco-friendly cars  not when there are profits to be had in catering to Americans who love the feel of a powerful luxury car. That's one class of automobile, after all, that seems at no risk of going out of style.